DHAKA: Bashundhara City, the 12th-largest shopping mall in the world, on Tuesday organized a fire fighting drill as part of its plan to check the level of preparedness to face emergencies. The Directorate of Fire Service and Civil Defence cooperated in arranging the mock fire fighting exercises from 11.00 am. 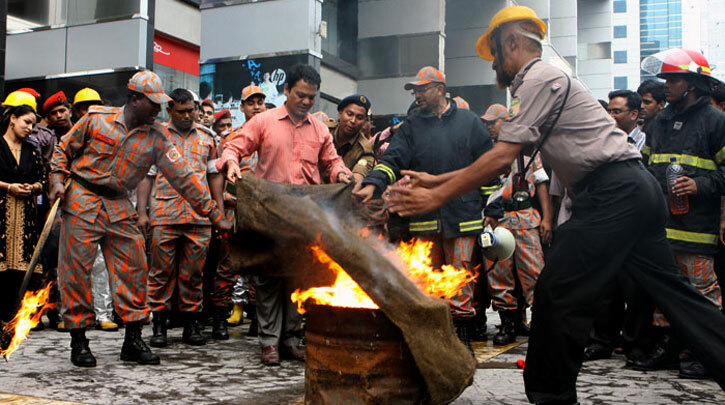 Bashundhara fire-fighters and fire units from the headquarters and Mohammadpur fire station conducted the fire drill. Bashundhara firefighters showed their skills in rescuing injured people, dousing flames and providing first aid to the injured. Employees acting as casualties were stretched off the building, and were provided with emergency medical care by the Bashundhara City paramedics within a short period of time.